Magnificent, endless sandy beaches, volcanoes, deserts and cities with interesting architecture, restaurants and shops - the seven islands off the coast of North Africa offer something for everyone. Currently we are offering accommodation options in Fuerteventura, Gran Canaria, Isla de la Palma, Lanzarote and Tenerife. You can finance your trip to the Canaries at our partner. La Palma Island - Eternal spring on "Isla Bonnita" (Spanish for beautiful island) or "Isla Verde", the Green Island. The most attractive island in the Canaries with temperate weather, beautiful scenery and magnificent beaches. La Caldera del Taburiente on La Palma is the world's largest volcanic crater, with a diameter of 9 kilometers and a depth of 770 meters. Los Cancajos Beach - The best and most protected beaches in La Palma, close to the airport and old typically Spanish capital of Santa Cruz de la Palma. The beach is a mixture of black sand and rocks, and features some lovely fish restaurants. Buses are available from Santa Cruz to the beach. Aparthotel El Cerrito, in the style of the Canaries, yet contemporary, is surrounded by lush nature and offers guests 37 rooms as well as a foyer, an air-conditioned restaurant and a hotel safe. The complex is situated in a quiet area of the tourist centre of Los Cancajos a mere 300 m from the beach. Guests will find restaurants and links to the public transport network in the surroundings and it is only 4.5 km to Santa Cruz de la Palma, and some 4 km to the airport. The pleasant rooms are decorated in modern style and are fitted with an en suite bathroom with hairdryer, a small kitchen with a fridge, a microwave, a coffee machine and a washing machine. The hotel is located in Breña Baja, La Palma, one kilometre from the sandy beaches of Los Cancajos and five kilometres from Santa Cruz De La Palma city centre. La Palma Airport is five kilometres away. The hotel has two outside swimming pools surrounded by sunloungers; one designated specifically for children. A complimentary buffet breakfast is served each morning, and the half-board rate includes breakfast and dinner. The onsite restaurant is open in the evenings for dinner, and drinks and light snacks can be purchased at the poolside bar. Cocktails are served in the Hall Bar. Tennis, squash, table tennis and billiards can be pursued within the hotel grounds, where there is also an onsite playground. The hotel organises a beginner's diving session each week; the local coastline is perfect for snorkelling. 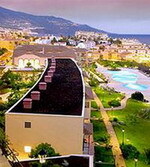 The H10 Costa Salinas is located in Playa de los Cancajos, on the island of La Palma, part of Tenerife, Spain. The beach is 300 metres away, and Santa Cruz de la Palma is at a five-kilometre distance. The residence extends to an outdoor pool with separate children's area, and offers table tennis, mini-golf, and billiards at its nearby sister property. The H10 Costa Salinas houses an informal buffet restaurant with bright, checked tablecloths. Guests of the residence can also enjoy use of the snack bar at the neighbouring H10 Taburiente Playa. The half-board rate includes breakfast and dinner. The 140 apartments have simple, modern decor in neutral tones and extend to kitchenettes, living areas, and balconies. 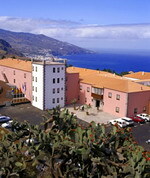 This seafront hotel is located on the island La Palma, with Los Cancajos beach at 200 meters from the hotel. Its varied offerings, its complete sports facilities which include swimming pools, tennis courts and miniature golf, its 3 convention halls, and its location make it the ideal hotel for a visit to La Palma, whether for business or pleasure. In the hotel you can contract excursions to the famous ´Caldera de Taburiente´, the observatory ´Roque de los Muchachos´ and the woodland of `El Canal y los Tiles. The hotel is famous for its delicious international buffet. Both breakfast and dinner consist of a great variety in both warm and cold dishes, show cooking, vegetarian and diet options. The H10 Taburiente Playa has 283 guestrooms and 9 suites that feature air conditioning, heating, satellite television, safes, minibars and balconies. The Parador de la Isla de La Palma is located in an area of great scenic beauty, close to the capital of the island and to the airport known as ‘El Zumacal’, within the municipal area of Breña Baja. The Hotel building is newly-constructed with traditional Canary Island architecture. It has an extensive garden of 44,000 m2, home to native plants and fruit trees allowing us to enjoy pleasant walks along several paths where the plants are identified by their scientific names. Stupendous views over the Atlantic Ocean invite us to relax in this incomparable hotel. In the restaurant we can taste magnificent traditional Canary Island produce, including a great variety of fresh fish such as Pompano and Cherne, amongst others. Los Llanos de Aridane - the largest and busiest town on the west side of the island with a population of just over 20,000. There are many modern buildings but the traffic-free centre and surrounding side streets still retain their old character. Los Llanos is approximately 35 kms from the airport and capital of Santa Cruz de la Palma. Major resort complex including both the Sol La Palma Apartments and Sol La Palma Hotel along the shoreline, overlooking the tranquil beach of Puerto Naos and located in the middle of an exotic banana plantation. Sol La Palma is located 8 km from Los Llanos de Aridane and 35 km from the airport and Santa Cruz de la Palma. Restaurant Los Tilos, offers an assortment of tapas and a daily menu. Beach Bar and Pool Bar, perfect for a quick lunch, an exotic cocktail or drink. Bar Taburiente with its musical duet, informal and relaxed atmosphere. 2 Swimming pools with sea-views, bar service, sunshades, sunbeds and towels. 307 Rooms: 11 Junior Suites, 20 Superior Suites and 276 Double rooms with balcony/Terrace and with sea or mountain views. Major resort complex including both the Sol La Palma Apartments and Sol La Palma Hotel along the shoreline, overlooking the tranquil beach of Puerto Naos and located in the middle of an exotic banana plantation. 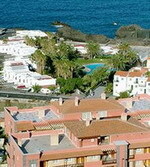 Sol La Palma is located 8 km from Los Llanos de Aridane and 35 km from the airport and Santa Cruz de la Palma. Restaurant Los Tilos, offers an assortment of tapas and a daily menu. Beach Bar and Pool Bar, perfect for a quick lunch, an exotic cocktail or drink. Bar Taburiente with its musical duet, informal and relaxed atmosphere. 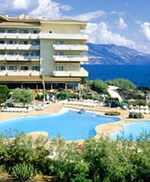 2 Swimming pools with sea-views, bar service, sunshades, sunbeds and towels. 163 Apartments resembling a traditional Canarian town: 7 two-bedroom apartments, 110 one-bedroom apartments and 46 studios - all with terrace/balcony with or without sea views. Macaronesia is the name given to the groups of Islands which scatter across the centre of the Atlantic. One such group is the Canary Islands which boasts the greatest variety of flora. Throughout the Canaries there is a mixture of endemic and cultivated plants, tropical and sub-tropical. The largest of the Canary Islands is Tenerife, which although by most standards a small island it does carry a rich diversity of plant life. One of the reasons for this diversity is the climate. Tenerife's climate is remarkably varied for such a small island, apparently caused by the winds being affected by the rugged contours of the land. There are reported to be some 140 plant species thriving on the Island thanks to the climate and variety of volcanic soils. For anyone interested in wildlife or flora there is are many treats awaiting them on Tenerife. Although the south of the island is quite dry and barren the rest of Tenerife has a wide variety of plant life to marvel at. The unusual Red Tajinaste, which flowers in late spring and the Las Canadas are among the most spectacular examples. The flowering Teide wall flower or Codesco spread a fantastic yellow carpet during the spring, creating a sight to remember and enjoy. Tenerife is also well known for the Drago tree, which is one of the oldest living members of the plant kingdom. 20 million years ago it was prevalent throughout the Mediterranean but the coming of the Ice Age meant that they remained only in Madeira, the Canary Islands and the Cape Verde Islands. Today they are only naturally grown in Tenerife and the neighbouring island of La Palma. Buy at AllPosters.com Tenerife's ancient settlers, the Guanches, revered the tree and performed sacred ceremonies with it. What was particularly interesting to them was that the colourless sap turned crimson upon contact with air and light. It became known as dragon's blood. The trees were looked after and have achieved a great age but it is difficult to be accurate because the bark does not create normal annual circles. Nevertheless, the most famous Drago tree, the Millenium Drago at Icod de los Vinos on the northern coast, is at least 650 years old and possibly over 1000 years. It is 17 metres high with a girth of 6 metres. They can be seen in most towns and villages in the north of the island. As well as the Millenium Drago, it is worth seeking out the Drago de la Ramble, magnificent against the blue ocean, and the Drago in the Sitio Litre gardens in Puerto de la Cruz. Endemic species of wild birds also have appeal. With its dark blue feathers and elegant appearance, the Blue Chaffinch is one of the most beautiful and distinct, and is found in the pine forests. They may have originated from the nearby African continent and then evolved during their isolation on Tenerife. Take time to enjoy the fantastic flora and fauna of Tenerife. Too often people only see the beaches and nightlife, yet the natural world has so much to offer when walking in Tenerife. In Christopher Columbus's time, the Canary Islands were believed to mark the end of the world. After being conquered by the Spanish in the 15th Century, the Canaries become a popular stopping point for explorers, traders and missionaries on their way to the Americas. The islands have also appeared earlier in Greek and Roman times and were written about in texts and affectionately named the "happy islands" and "fortunate islands". It is no surprise that the fantasy city of Atlantis has also been theorized to lie amongst the sub-tropical islands making up the archipelago. Suffering some tumultuous times in the past few centuries, the Canaries now enjoy the protection of Spain while remaining an autonomous community with a thriving tourist industry. Nowadays the Canaries are best known for being a popular tourist destination especially for Europeans. In fact, tourism makes up 32% of the economy which is hardly a revelation considering the islands' mild sunny climate that it enjoys all year round, with temperatures rarely falling below 18C in winter or above 24C in summer. The climate is regulated by the warm Gulf Stream and Trade Winds making any time of year good for a visit. The seven islands that make up the archipelago offer visitors a range of activities, scenery and lifestyles that can live up to any vacationer's desire. The lively islands of Tenerife and Gran Canaria at the centre of the island chain host some wild resorts teeming with beach activities and night life. Many people choose to stay here for the social scene but the islands also offer plenty of options for taking a break from the partying to enjoy some of the island's natural beauty. Buy at AllPosters.com If nature rather than nightlife is what appeals to you, there are plenty of other islands to explore. La Palma is considered the most beautiful and untouched of the islands and has its own microclimate. Visitors to the island seek its lush, green rainforest-like atmosphere but often don't realize that this foliage is a result of the higher levels of rainfall it receives! Designated a national reserve in 1974 and subsequently recognised as a globally protected site by UNESCO (the United Nations Educational, Scientific and Cultural Organisation) Lansarote's Timanfay Park should not be missed by those seeking fantastic volcanic island landscapes including black sand beaches and fields of petrified lava. The island Fuerteventura boasts the longest beaches of the Canaries and is most popular for family holidays or couples seeking a tranquil holiday away from it all. Cheap flights to Fuerteventura and the other islands are easy to find in advance or on the fly. Whether you are looking for all night raves and foam parties or a quiet holiday in gorgeous surroundings, the Canary Islands can deliver. Choices amongst the seven islands abound and the close proximity to the UK and plentiful flights available make the islands an ideal destination for a short getaway or a longer visit. About the Author - Andrew Regan is an online, freelance author from Scotland. He is a keen rugby player and enjoys travelling.